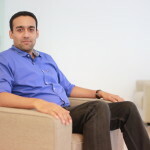 Rajiv Srivastava co-founded Urban Ladder with Ashish Goel in July 2012. The founders saw a huge gap in the furniture space in India, customers were devoid of good quality furniture due to lack of trusted brands and poor service in this category. They launched Urban Ladder with the aim of making a million Indian homes beautiful, with great quality furniture and exceptional customer service. Urban Ladder is a curated destination for home solutions with over 1000 products and 25 categories such as wardrobes, sofas, beds, dining tables, storage shelves etc. The founders say that the first few customers came in through word of mouth. They reached out to people that they knew and sold them the concept of quality furniture and those people began buying the products from Urban Ladder and began referring Urban Ladder to people they knew based on the quality of the products. Urban Ladder launched with a very curated set of just 35 SKUs but ensured that there was a lot of focus on product design. The focus on offering best in design and quality was their differentiators in winning the first few customers. The founders recollect Urban Ladder starting pan India operations and worked with third party logistics teams to deliver furniture across the country, however they had their own delivery team in Bangalore. Soon the founders realized that customer complains about product damage were increasing in other cities but customers in Bangalore were very satisfied with the product quality and service. They concluded that a category like furniture needs special care during transit and assembly and installation are critical post delivery services. The founders then decided to take the tough call of rolling back from all other cities and re-launching only with their trained delivery and logistics teams and hence delivered their product only in Bangalore. They did not want to compromise on the service or product quality and we were sure we wanted their customers to have only the best experience shopping with Urban Ladder. This tough call helped Urban Ladder a great deal in establishing a brand that stands for quality and great customer service. Urban Ladder is now present in seven cities and will launch in other cities only with their trained delivery and logistics teams. Rajiv’s advice to founders – Immense focus helped set a very clear direction for us in the early days. It’s very easy to get distracted and try and do a lot of things – but you will end up biting more than you can chew. We have learnt this lesson along the way. This focus has helped us stay ahead in the market and establish a clear positioning for ourselves. Urban Ladder(www.urbanladder.com) is the largest player in the online furniture market in India today and they are well on their way to become the largest furniture and home décor player in India in the next 18 months. The team is growing rapidly to keep up with the pace at which they are scaling up. They have doubled in headcount in the last 6 months and are now a 160 member strong team. Last year, IAMAI awarded them with the The Best Digital Startup of the Year award. The feather in the cap came in when Tata Group chairman emeritus Ratan Tata invested in the Urban Ladder.